Sometimes things just make sense. This is the Circuit de Cataluyna in Barcelona, where in Grands Prix pole sitters are rewarded even more consistently than at Monaco - only two of the previous 14 who started first had failed to still be there at the race's end. Nico Rosberg won pole yesterday, and indeed had finished every race exactly where he started in 2015 so far. Even more granularly, the last eight Grands Prix here had been won by eight different drivers - and Nico had never won here before. 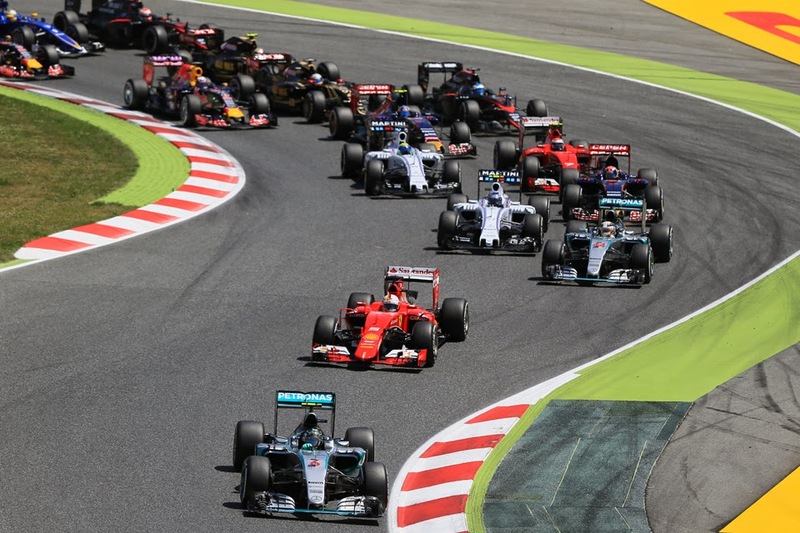 And who won out in today's Spanish Grand Prix? I think you know that one. Nico's win may strike at the broadest level as a surprise, but it again was something that added up. At the most broad level for all that it has been open season on Nico in 2015 so far really the only difference between his first four rounds and those of 2014 - at the start of a campaign wherein he took the title to the wire - was that then Lewis Hamilton had a technical failure in the first race, granting Nico a 25 point gain. On average he was finishing races closer behind his team mate too this time, while the Sunday in Bahrain last time out confirmed that whatever else was happening the claims that Nico had lost his fight were wide of the mark. He hadn't become a bad driver, and there was still plenty of time for things to change. And they changed somewhat today. While the considerations of the opening paragraph make it sound like his triumph could have been a shoo-in, to conclude that would sell Nico short. His pole lap yesterday was as sweet as a nut, while in the race he was immaculate out front. It's impossible to argue with that. He was admittedly presented with something of an open goal as he led out of the opening complex while his chief rival Lewis sank behind Sebastian Vettel's Ferrari, where for various reasons he stayed bottled up for half of the race. But Nico still struck the ball confidently, cleanly and hard into the back of the net. He did not put a wheel out of line that I saw, not even as his freshly-booted team mate ate at his lead after a midstream change to a three-stopper. This is yet another thing to add up, as we saw repeatedly last year that Nico is one capable of winning races like he's born to do it. As well as that he is one not easily discounted; that relishes seemingly in - just at the point he's being written off - reminding us all rather rudely that he remains a contender. As intimated the race rather was framed by the first corner, and we'll never know what would have transpired had Lewis had a clear run at Nico all day. It was framed further at the first stops when Lewis lost a tiny, massive, couple of seconds with a stubborn left rear wheel not wanting to detach, consigning him to yet more laps in Vettel's turbulence - particularly regrettable at this track with its long corners. Lewis's championship lead only has had a nibble taken from it. He still has 20 points - nearly a race win - in hand. But this weekend could well change the mood. And we witnessed last year that mood can mean rather a lot. "It was a perfect weekend" he said, "very very happy, thanks to the team, that car's been awesome all weekend". Noting the race's crucial point he went on: "Finally I got the great start as well, it's been a long time coming..."
Lewis too acknowledged the importance of the get-go. "Got a bad start, lots of wheelspin" he noted. He was however minded that his championship position remains a strong one: "I'm grateful that I could get back up to second for the team...this is a difficult weekend for me, I'll definitely take it." The next race too is in Monaco and Nico won on the last two visits there. The man himself wasn't getting too far ahead of himself though: "I'm just enjoying the day today". Still on today's evidence at least 2015 is shaping up a little like 2014 did. And in more ways than one, as Ferrari's time of it was uncomfortably redolent of its struggle of the years immediately prior to this one. Its technical upgrade brought here looked iffy while in the race Seb finished third but 45 seconds after Nico. 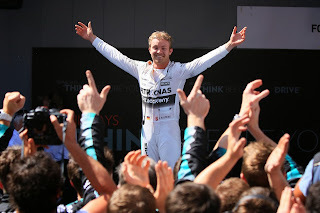 Perhaps this is our most important take-out from the weekend, summed up by Nico stating triumphantly afterwards that Merc has "won the development war". The Mercedes non-executive chairman Niki Lauda too described the gap to the red cards as the "the most important thing for the team...I'm thinking of the future." Still thinking of the future Lauda added also with his typical frankness that Nico is "truly back and I'm happy for him as Lewis blew him off in the first four races, now he's fighting back." Seb on the radio during the race was frustrated with his strategy, particularly in terms of keeping him clear of traffic, but even there he gave the game away by adding "I know we're driving our own race". 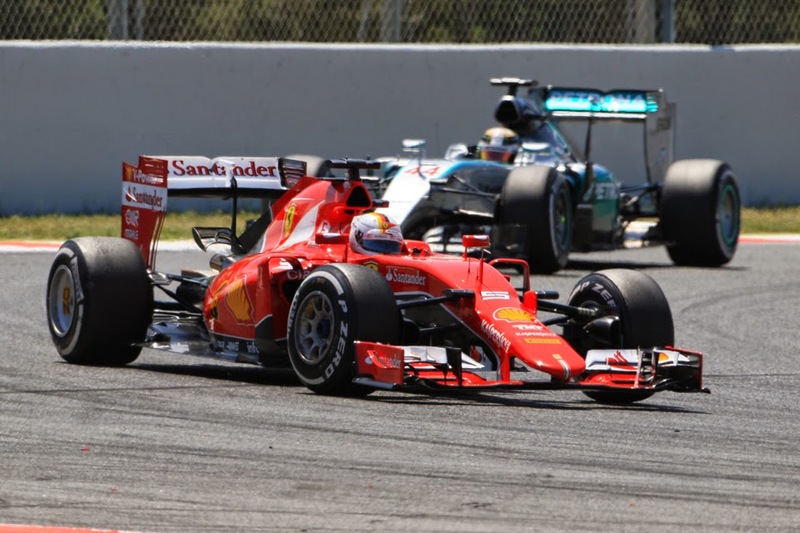 F1 parlance for the red cars had no hope of staying with the silver ones. He continued in a similar vein on the podium, admitting that "we couldn't really keep up with the pace they (the Mercedes) had today, so third was the best we could do". He also played down the notion that he'd have been better served by mirroring Lewis's three-stopper - "we tried everything we could" he admitted. It's just one race of course, so it remains to be seen what happens next. Seb too was insistent afterwards that the benefit of the upgrades will become more obvious in the next two rounds. 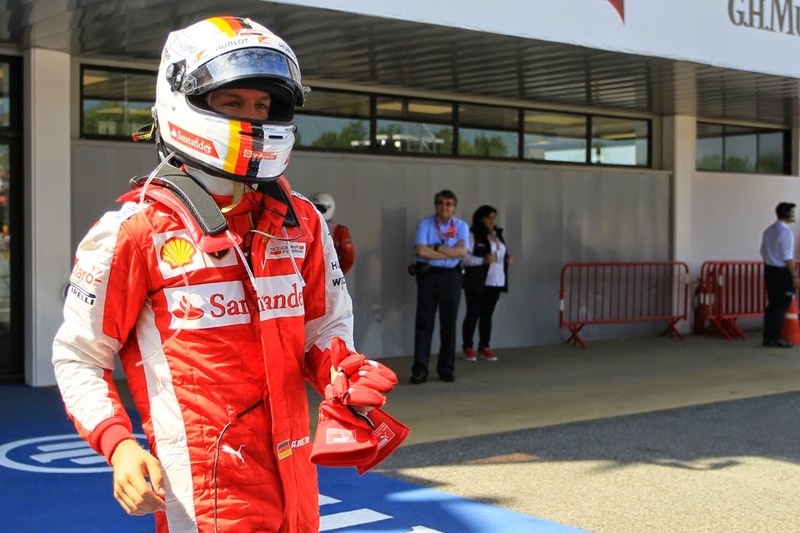 But a few pondered rather sagely even during the team's encouraging start to this campaign that it'll be the inevitable time that things go less well at Ferrari - and more to the point how the management reacts to it - that will tell us if the Scuderia really has turned the corner. Kimi Raikkonen meanwhile showed his new found lap one aggression to clear both Toro Rossos pronto and then pursued a rather contrary strategy as in Bahrain by using the harder tyres in the middle stint. It didn't really do much for him though this time, as just like Seb last time out he couldn't clear Valtteri Bottas despite several laps of trying, thus fifth behind his fellow Finn was the best he could manage. The other Williams of Felipe Massa in sixth was the only other one not lapped, after an odd weekend wherein he never seemed to get on terms with Bottas. 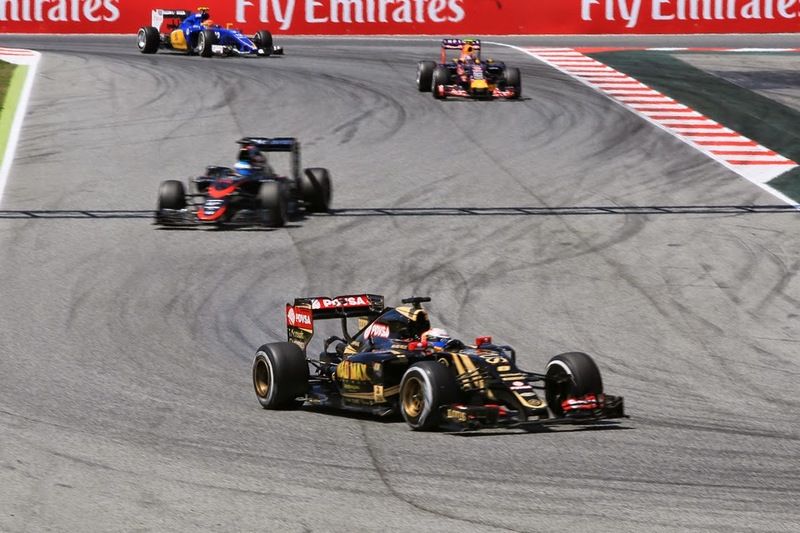 Daniel Ricciardo was another to have a quiet race on the way to seventh, while Romain Grosjean next up had anything but, with an off track excurison at turn one, running over his jack man at one of his stops as well as a gearbox problem for some of the way. He got away with it though. By contrast his team mate Pastor Maldonado looked the more convincing of the Lotuses but was more harshly punished with a rear wing end fence breaking away, perhaps the curious consequence of a tap against Grosjean as he passed him after Romain's off that we've mentioned. Whatever else you think of Pastor he doesn't seem to get a great deal of luck to go with everything else. The Toro Rossos after a great qualifying were less impressive in the race, not helped by straightline speed that beat only the Manors and they seemed to be mugged time after time at the end of the main straight. Carlos Sainz at least salvaged ninth despite a contretemps with Daniil Kvyat over that place on the final lap (which the stewards investigated but didn't punish). McLaren too disappointed. Jenson Button with all sorts of problems finished a sad sixteenth. Fernando Alonso's day looked more promising, being about the last to pit in the first round of stops and his longer strategy seemed to be boiling up nicely, perhaps for a point or two. But then his day was ended dramatically when an errant tear off (apparently) got into a rear brake duct and caused them to overheat. As ever interpreting this result for the Woking team depended a lot on your expectations, and there still was round-by-round progress kicking around in there somewhere. Then again, there always was going to be a steep learning curve on this McLaren and eventually it'll find its place. Where this will be remains the big question. Something that seems rather clearer is the Mercedes' place. Which after this weekend looks a lot more like the place we got ever so used to it being last season. The crucial matter in this scenario will also be a lot like last season, that of where exactly Nico Rosberg fits in with it all. Like last year too, it might just add up to a title challenge. Certainly like last year, we'd be foolish to rule him out of it. Interesting that the Merc drivers are told they can race, but Hamilton is told by his engineer to hold station. This could lead to fireworks later in the year if the points between them are close. Having said that, it would have been a suicide mission from Hamilton. Rosberg would have managed to gap to Hamilton until Hamilton's tires went off (and he possibly went off track. Remember Hamilton pushing too hard in Brazil, spinning and losing the race? He would have looked mighty foolish if he spun yesterday trying to catch Rosberg. As I said before this championship is far from over. Re McLaren, Alonso and Button deserve better than this, it is embarrassing and we have been hearing the excuses for far too long. Hi Osborne. My suspicion is that when Lewis was told to hold station Merc was more minded about engine mileage and the like, so it didn't necessarily contradict previous claims that the two are allowed to race. But still, while Lewis wasn't going to catch Nico at the rate he was closing I still thought he was right to keep at it - after all, you might pressure Nico into an error, or if he has a mechanical problem late on (as he had in Bahrain indeed) you're close enough to take advantage. McLaren has improved race-on-race this year but that always was going to happen given where it started out in Australia. Suspect it'll be a little disappointed in where it ended up in Spain, but it also was never going to be a quick job so let's see where the car ends up in time. Still think too the team has everything in place to get it right in the end.